Los Angeles, CA – September 4, 2018 - Los Angeles' reigning Pumpkin King, Danny Elfman, will return to the Hollywood Bowl on Friday and Saturday, October 26 & 27 at 8:00 pm performing his role of Jack Skellington singing live to film for a very special screening of Disney's timeless holiday classic, Tim Burton’s “The Nightmare Before Christmas" for the film’s 25th anniversary. The immersive experience will include live scenery projections, live orchestra, spectacular guest artists, and an all-star cast. 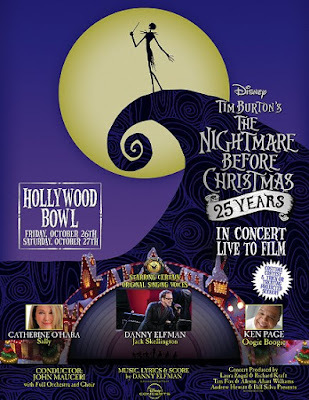 Elfman will be joined by other original cast members including Catherine O'Hara (Sally) and Ken Page (Oogie Boogie) who headlined the opening production, which sold out two nights over Halloween weekend at the Hollywood Bowl in 2015 and returned for 3 nights in 2016 due to overwhelming demand. Tickets go on sale Saturday, September 8 at 10:00 am via all Ticketmaster outlets with a special American Express presale starting September 5 at 10:00 am and ending September 7 at 10:00pm. To purchase by phone call (800) 745-3000 or online at https://www.ticketmaster.com/venueartist/90150/2541294.